The final weekend of the NRL season is here and what better excuse to fire up the barbie?! This year, ditch the bulk-buy snags and horrible, artificially flavoured chicken kebabs for a delicious char-grilled chorizo roll. 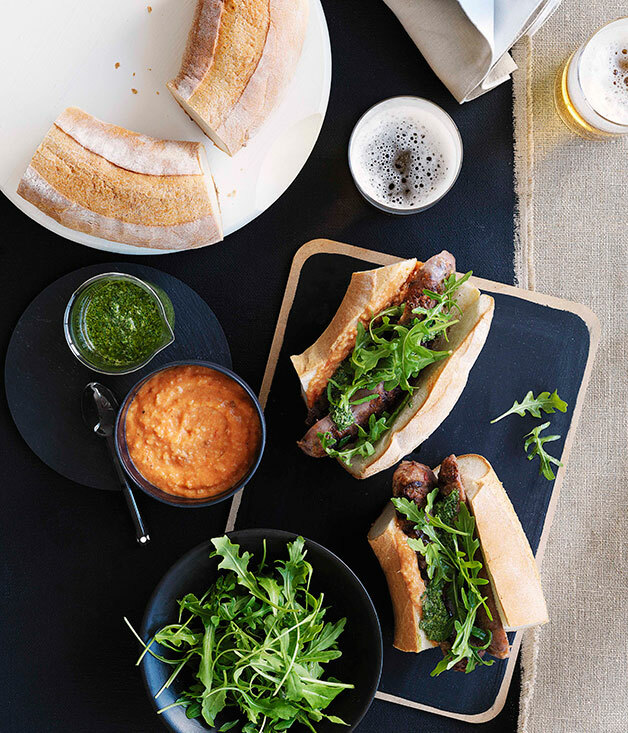 Served with two yummy sauces and salad sides, these rolls are sure to be a hit. For roast tomato salmorejo, preheat oven to 200C. Place tomatoes on an oven tray, drizzle with 30ml olive oil, season to taste and roast until dark golden (8-10 minutes), transfer to a food processor. Combine bread in a small bowl with 60ml cold water, stand until soft (2-3 minutes). Add to food processor with garlic, process until smooth, then, with motor running, add remaining oil in a thin steady stream until emulsified. Add vinegar, season to taste, process to combine. Makes 250ml, will keep refrigerated for up to five days in an airtight container. Meanwhile, for salsa vinagreta, process capers, egg and garlic in a food processor until finely chopped. Add herbs, process until coarsely chopped, then, with motor running, add oil in a thin steady stream and process to a fine paste. Add vinegar, season to taste and set aside. Makes 250ml, will keep refrigerated for up to five days in an airtight container. Preheat a char-grill or barbecue to high heat. Cook chorizo, turning occasionally until browned (6-8 minutes). Split lengthways, then stuff into rolls and serve with wild rocket, salsa vinagreta and tomato salmorejo. Best washed down with an icy cold beer!